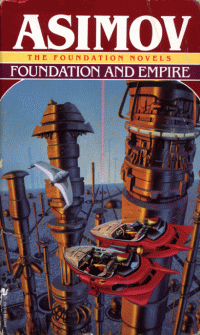 Foundation and Empire is broken up into two longer stories, rather than five shorter ones that appeared in Foundation. The first story, The General, begins almost 200 years after the Foundation was established on Terminus. The second story, The Mule, takes place just over 300 years into the Foundation Era. I think I liked this book more because the stories were longer and the character development was a bit deeper. Also, it seemed that the action picked up noticeably compared to the last book. The first story focuses on Bel Roise, an accomplished general of the Galactic Empire, who is searching for the “magicians” of the periphery. These magicians are from the Foundation, and have met several Seldon crises already and have always come out on top. Bel Roise intends to crush the Foundation before they become too powerful. It seems that the General will succeed, surrounding the Foundation using a tactic which has never before failed, but he underestimates the capabilities of two of his Foundation prisoners. One of the most important themes in this story revolves around “faith” in the principles of psychohistory. Ducem Barr of Siwenna (Onum Barr’s son from Foundation) is steadfast in his belief that no matter what anyone does, the Foundation will prevail. Surely the “dead hand” of Hari Seldon will guide the Foundation to victory. Bel Roise does not believe in destiny, rather will challenge psychohistory with his “living will”. The second story focuses on a warlord that calls himself “The Mule”. He has mysteriously risen to power out of nowhere and has never lost a battle. His conquests appear to be easy despite impossible odds. His enemies surrender quickly with little or no bloodshed. The latest world to fall to The Mule is Kalgan, a resort world which had recently been conquered by another aspiring warlord. The leader of the Foundation on Terminus, Mayor Indbur, is not worried when Captain Han Pritcher warns of this new threat at a disciplinary hearing. Pritcher has refused orders from his commander to visit a Trader world called Haven because he believes that The Mule poses a much greater threat to the Foundation. The mayor is more concerned about Haven which refuses to pay taxes to the Foundation. He orders Han Pritcher to investigate Haven, but the insubordinate captain sets out for Kalgan instead. The Trader worlds are also interested in The Mule, sending a pair of newlyweds (Toran and Bayta) to Kalgan under the pretence of a honeymoon. Essentially they are to try and get more information about The Mule, but end up more involved than they had planned. After rescuing a pitiful looking clown, court jester and entertainer to The Mule, they escape Kalgan with the help of none other than Captain Han Pritcher. This clown was named Magnifico Gigantus by The Mule as a joke because he is small and wiry. The Mule uses the escape of Magnifico as an excuse to attack the Foundation. While he conquers worlds he demands the return of his precious clown. Psychologist Ebling Mis, known as The Scientist, works with Magnifico to try and extract information about The Mule to help the Foundation defend themselves. It turns out The Mule has strong mental powers, something which Hari Seldon’s calculations couldn’t have accounted for. Fortunately there is a Second Foundation, but nobody seems to know where that is. At the defeat of Terminus Ebling Mis, Toran, Bayta, and Magnifico escape to head toward Trantor to search for clues in the University Libarary. I like how Asimov likes to take a spin on cultural norms whenever he can. For example, the Traders don’t normally marry, because they hardly even stay put long enough to “qualify” for marriage. The resurgence of succession by birth of the mayor is another example of how society seems to always be changing. Women from the Foundation are treated as equals, astonishing those in the crumbling Galactic Empire. There are many other things here and there that add up to make an interesting picture. I think that having read the prequels before the original trilogy gives me a lot more insight into what is going on behind the scenes. Obviously there is a Second Foundation with mental powers, but we don’t know yet if they can possibly match the freak mutation of The Mule. This story is the culmination of all of Hari Seldon’s fears at the end of Foundation’s Triumph. As usual, Asimov ties off just about all of the mysteries in a nice little bow in the final few pages of this book. I’m sure that there will be a few surprises for just about everyone to enjoy.